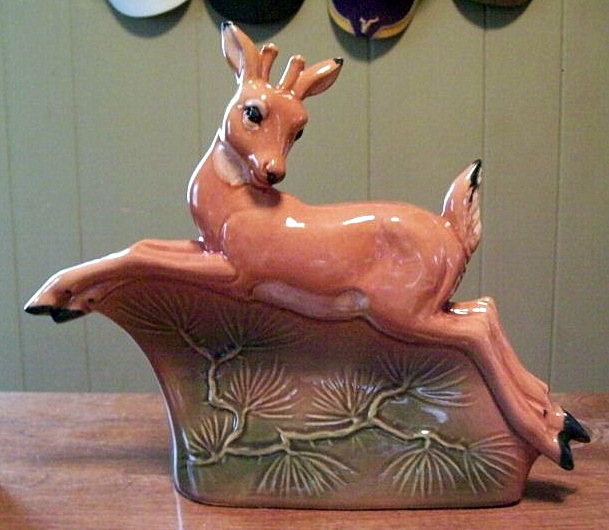 Founded in 1940 as the Wahpeton Pottery Company, this North Dakota manufacturer became Rosemeade Potteries in 1953. 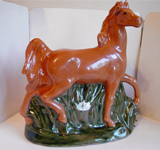 Rosemeade, which closed it's doors in 1961, produced many figurines, salt & pepper shakers, ashtrays and flower holders that are highly valuable to collectors today. 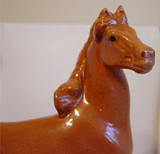 They are known for their inventive use of glazes and for depicting animals native to North Dakota. 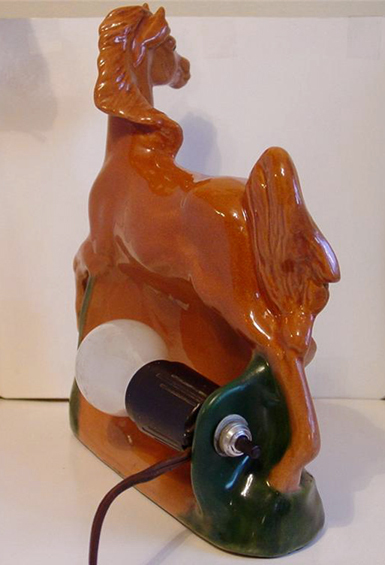 Only seven TV lamp designs were produced at Rosemeade, the six shown below and a "stag" (American Elk) lamp. None were produced in great volume, and all are extremely valuable. 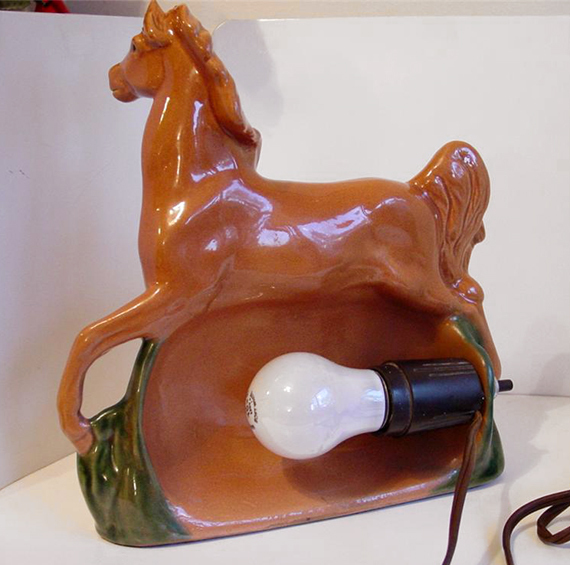 This Rosemeade Horse TV lamp is very hard to find, and when you do you can expect to pay somewhere in the $500-$700 range for it. 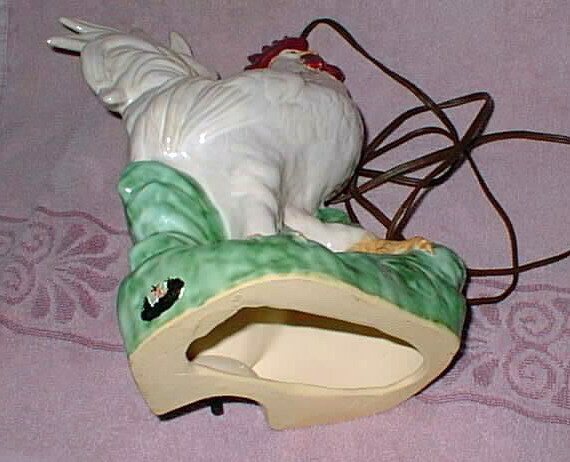 Manufactured in several colors. Photos courtesy of David Steiner from Long Lake, Minnesota. A back view of the Rosemeade Horse. 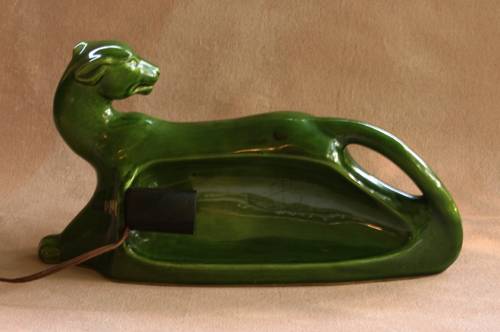 This ferocious-looking Rosemeade Panther TV lamp is a beautiful, distinctive design, and quite rare. 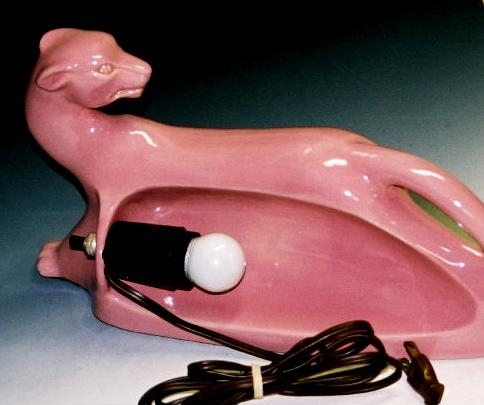 Of particular interest is the beautiful pink glaze, unlike that found on other TV lamps. 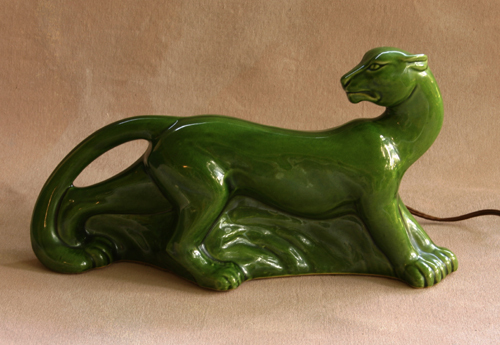 The panther can also be found in forest green, black and bronze. Expect to pay over $600 regardless of color. Photos courtesy of Joan Parker from WINDMILL Warehouse. A look at the back of the Rosemeade Panther. 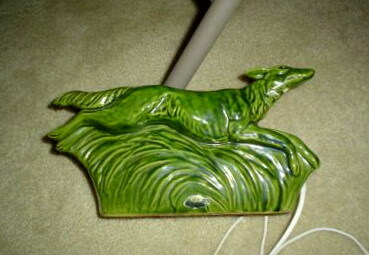 The same panther TV lamp design as shown above, but this one in the color that Rosemeade called forest green. 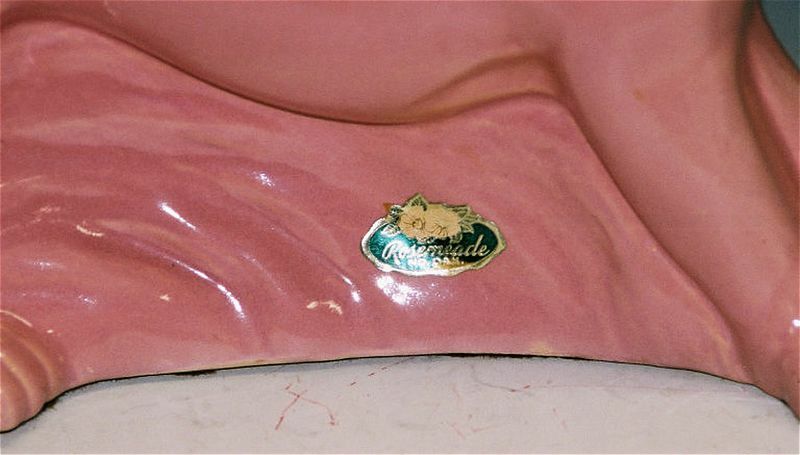 Back view of the green Rosemeade panther. Rosemeade made one of the more ferocious-looking panthers! 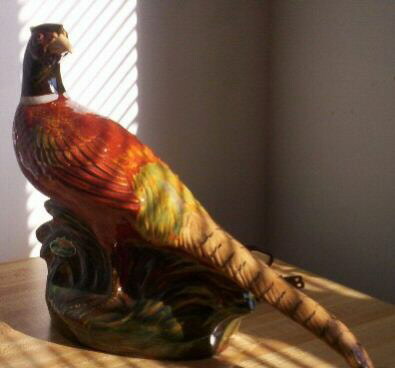 Pheasants were a popular subject for Rosemeade, appearing as figurines, salt & pepper shakers as well as on ashtrays. 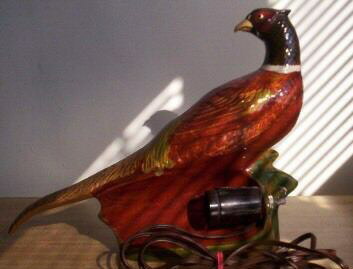 This pheasant is certainly one of the most prized Rosemeade TV lamps, easily bringing $500 or more. 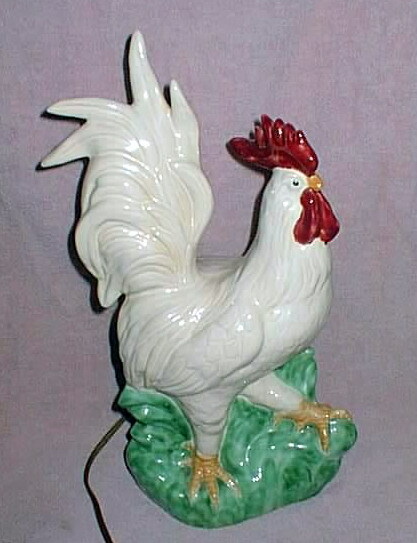 Even more rare, it was also made in solid colors on a special order basis. Photos courtesy of Peggy Cook of Long Lane, Missouri. Back of the Rosemeade pheasant. 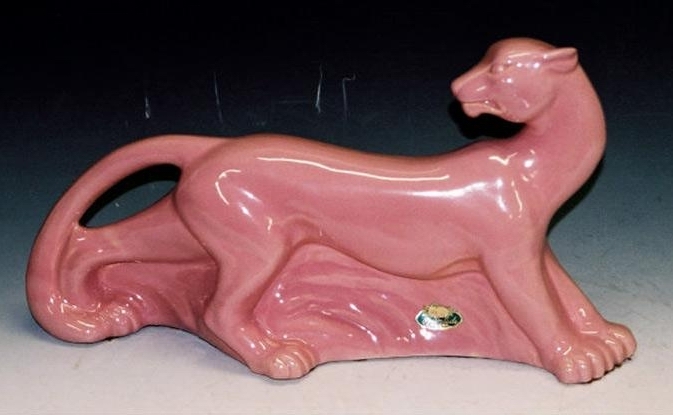 All Rosemeade TV lamps are extremely rare, and this dog lamp is no exception. Made in four solid colors: gray, russet, forest green and dark brown. Photo courtesy of Lloyd & Dawn of Powell, Wyoming. 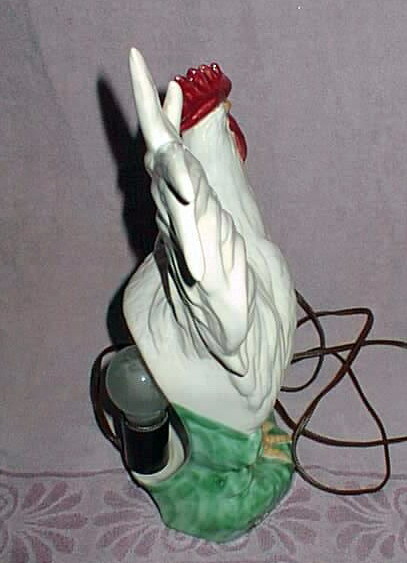 This rooster TV lamp by Rosemeade is undoubtedly the most sought-after of all the makers lamps. 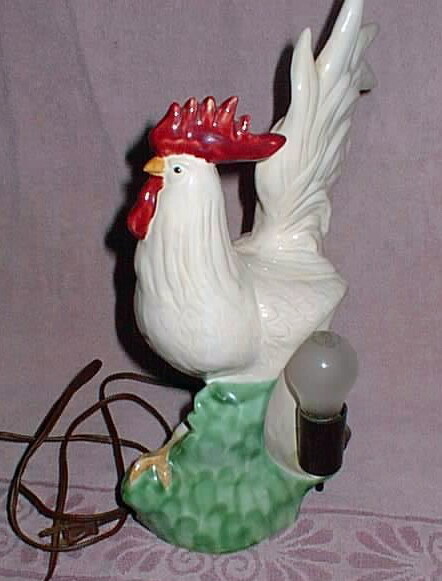 It has the distinction of bringing the all-time highest auction price for a vintage TV lamp, hammering down for $3,550.00 in 2006. Photos courtesy of Joel Nokota from Fort Ransom, North Dakota. Another look. 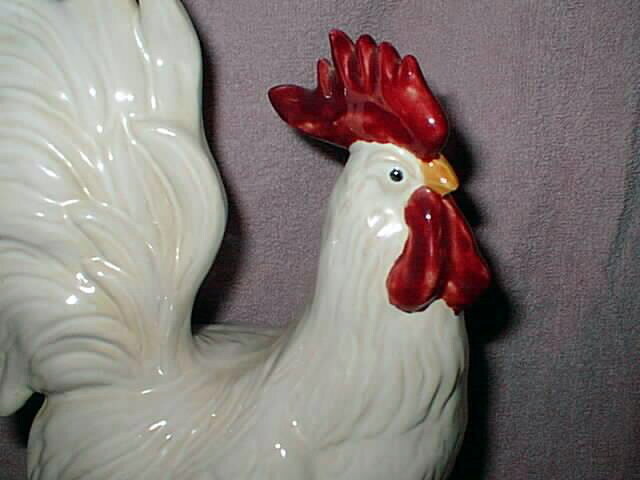 Rosemeade's rooster was also made in black, brown, and a greenish-shade of brown. This back view reveals the placement of the fixture. 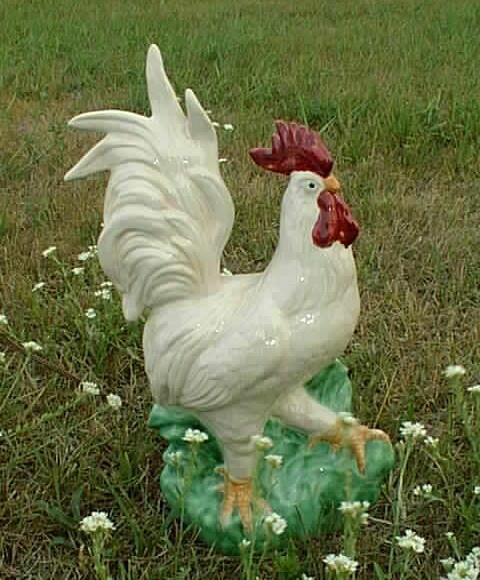 Another look at the back of the Rosemeade rooster. This bottom view also shows the foil Rosemeade label. 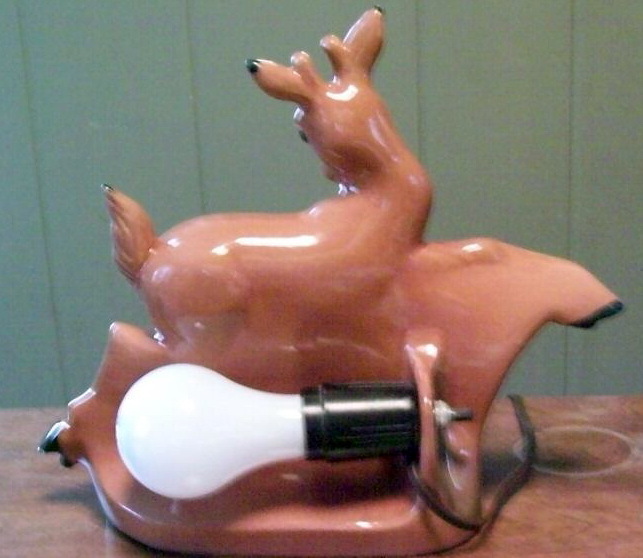 A highly coveted TV lamp, this Rosemeade deer is rare. Photos courtesy of eBay seller, ibselln1.